I don't know much about web site traffic, but I do know how to read a chart. 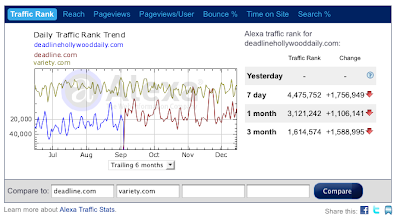 If you'll see the graph below courtesy of Alexa.com (an Amazon.com company) Darling Nikki's boast about her site traffic beating Variety doesn't overlap with what the chart below seems to indicate. The tan line is Variety.com's daily traffic rank. The blue line is (which becomes the red line when DeadlineHollywood.com became Deadline.com) seems to be BELOW that line. Color me confused.